I found myself with some free time(!!!) 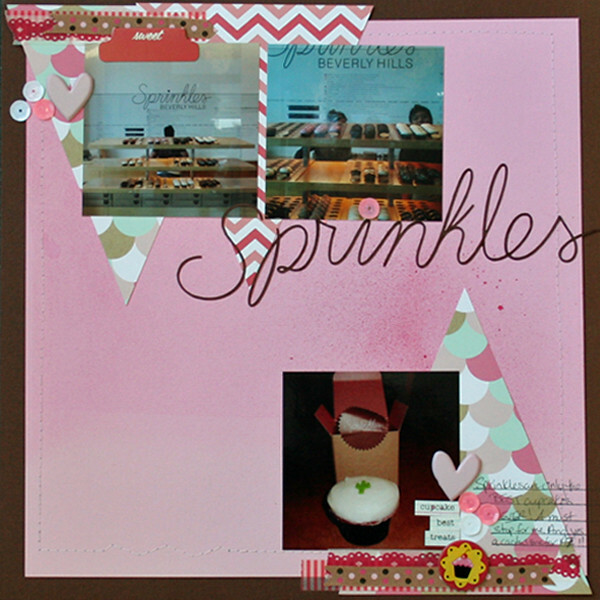 last week to create after I finished up some DT layouts for ScrapMuch? and I was still feeling inspired to create some more. I was loving the sketch that Laura had posted to Stuck?! Sketches because it was out of my comfort zone. I’m also trying to scrap some of my older photos before I print and move on to the new, but sometimes that’s a challenge after looking at them so much! I also felt the same way about a few of my papers in my stash that I’d been hoarding and now starting to grow bored of. The paper company, Luxe is no longer in business but they did some really swanky & edgy designs. I even loved that this line was called Cocktail Dress. It was perfect for this layout of a monster sized mango margarita! What I also totally love is the whimsy olive pattern on one of the papers, and the hexagon pattern that was so in not so long ago! The blurring of the outline was a happy accident as I used my Sharpie paint pen and moved the ruler before the paint was dry – and seemingly works with the unfortunately blurry photo of me with that margarita (that’s what happens when you hand off your P&S to someone who isn’t up on the nuances of it!)! For the record, the margarita, like everything else at Arriba, was fantastic!!! Stay tuned as I have another reveal for ScrapMuch? going live on Friday, and then it’s time for Inspiration Unlimited. So excited! For those not in the know, Inspiration Unlimited, or IU for short is an event put on by the amazing Teresa Collins every year in Henderson NV. I’ve been fortunate to attend for the last 2 years, and this year will be my third. As far as scrapbook events go this one is a bit on the small and intimate side of ~300 scrappers. It’s been sold out for a few years (if not all) and there is a waitlist to attend. If you want to join the waitlist please email EVENT@TERESACOLLINSSTUDIO.COM! I will do my best to blog regularly while there but the days are so full of fun that I don’t get a lot of blog time! And I love every second of it!! It’s hard to believe the dog days of summer are behind us and the crisp fall days lie ahead. With the start of the new month, it’s time for the ScrapMuch? team A reveal! We had an amazing bunch of submissions last month, both in quantity and quality! Wow! In keeping with routine, the first sketch of the month is a 2-pager. 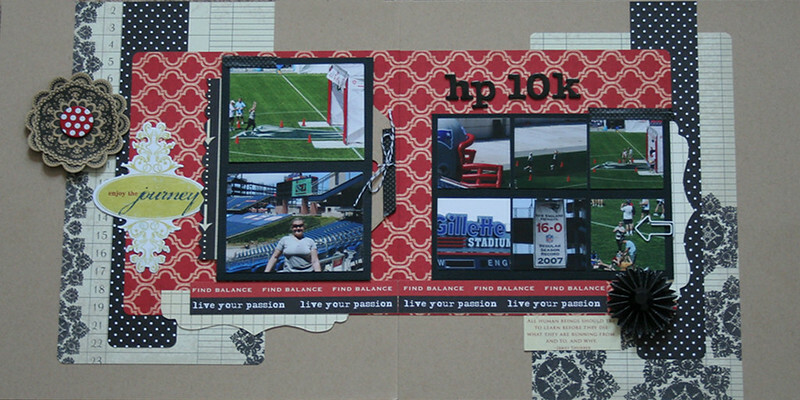 This sketch was great to work with the multitude of photos I have from the Harvard Pilgrim 10k run I did 4 years ago. The race began at Gillette Stadium in Foxboro, MA and ended on the 50 yard line in the stadium. It was also on July 4th of 2010, so I got to experience a lot of Independence Day festivities afterwards too! That was my second stadium run that year; the other being the Soldier Field 10 Mile in Chicago, IL. This was also my unexpected retirement run. As in, I haven’t willingly run another kilometre since. The day was hot and humid, I developed GI upset early on in the run and opted to not push it, and that my goal wasn’t a decent time, but just for the experience to finish on the turf of my favourite team. That being said, I did get to run through the inflatable helmet like the players do, and I cued up my iPod to Ozzy Osbourne’s Crazy Train when I entered the stadium; the same song the players run in to. I’ve also used a collection of products on this page and even dug into my beloved Scenic Route stash for the word strips and polkadot and grid paper. I thought it was fitting and well worth using. Thankfully, red, black and kraft are neutral and generic and work so well together no matter the manufacturer. Years ago when I took one of my first Ali Edwards workshops she said that was her go-to palette to have on hand, and I’ve since followed suit and agree. I’d love for you to hop on over to the ScrapMuch? blog and see what the rest of the team has created with this sketch. 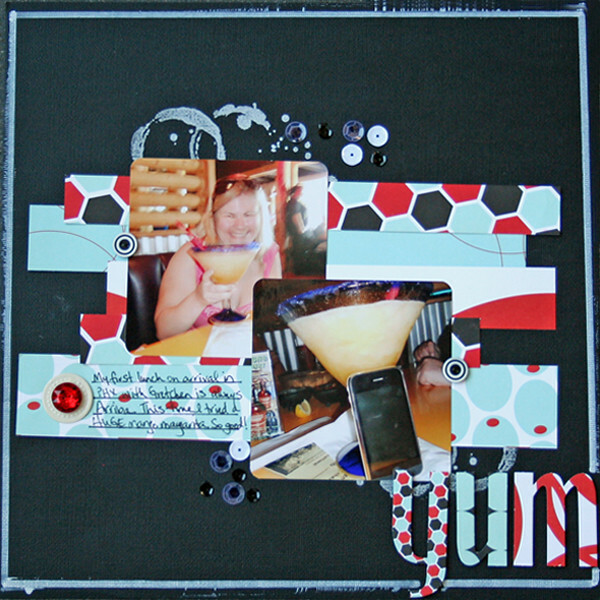 Don’t forget if you play along and share with us you will have a chance to win an awesome ScrapMuch? prize! Check out the ScrapMuch? blog for the deets on our monthly sketch challenge! Have a creative weekend! See you again for sure in 2 weeks for my next reveal!